When we pray, we invoke the name of God alone. Not a nation. Not a party line. Not a flag. True, we give thanks on this day for the country in which we live, even lifting in prayer the names and offices of all those who serve within positions of influence and power. But we also clasp our hands in prayer on this day- and everyday- on behalf of all of humanity and all those subjected to the disorders of this world. Our prayers of intercession are never to be limited to those who live within our national borders. “One can be God’s witness only by becoming so ever anew. This is just what happens in prayer” (Church Dogmatics III.4, p. 87). “Even in common prayer...will be simply a sighing and stammering, both in its beginning and in its end"
“Prayer means that we address ourselves to God…Prayer cannot therefore in any way estrange us from other people; it can only unite us since it involves a matter that concerns us all” (Prayer 11). “Our prayers are weak and poor. Nevertheless, what matters is not that our prayers be forceful, but that God listens to them. That is why we pray” (Prayer 13). “To be a Christian and to pray are one and the same thing; it is a matter that cannot be left to our caprice. It is a need, a kind of breathing necessary to life” (Prayer 15). “One cannot say, ‘Thy kingdom come!’ without hope for our time, for today, for tomorrow. The great Future, with a capital F, is also a future with a small f. (Prayer 39). “The children of God are not anxious about work. They work because they pray” (Prayer 50). “That Christians call upon God, that they do everything they do in this calling upon God, is what is expected of them as those who are obligated and committed to Jesus Christ. It is the command they must keep if their action is to be obedience” (The Christian Life 50). “Invocation of God in and with [the Lord’s] prayer, obedient human action in this vertical direction, implies (as the same obedient human action) the horizontal of a corresponding human, and therefore provisional, attitude and mode of conduct…Thus to pray the prayer does not excuse [Christians] from provisionally rebelling and battling the disorder in their own human thoughts and words and works” (The Christian Life 212-213). “The heart of the Christian ethos is that those who are free and summoned to pray ‘Thy kingdom come’ are also freed and summoned to use their freedom to obey the common that is given therewith and to live for their part with a view to the coming kingdom” (The Christian Life 263). “And this means that theological work must really and truly take place in the form of a liturgical act, as invocation of God, and as prayer” (Evangelical Theology 164). “Prayer without study would be empty. Study without prayer would be blind” (Evangelical Theology 15). *As much as I love Barth’s works, Dr. Daniel Migliore is correct to note Barths lack of engagement with lament in his writings on prayer (see “Freedom to Pray” in Karl Barth’s, Prayer). 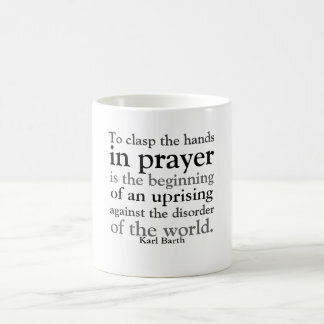 However, I wonder if lament was somewhat assumed when Barth suggested prayers as the beginning of a revolt against the disorder of the world. In other words, was Barth constantly lamenting the chaos that sought to claim sovereignty over God’s creation? Would this not serve as reason to aid in such confessions as the Declaration at Barmen?